There are so many things that appealed to me about this book! The theme of adoption and the struggle Lana had with being loved and expressing love was a strong one for me. I loved that she is an artist and I related to her on that level as well. The relationship with her friend Ingrid showed Lana's lighter side, and helped it not seem out of character when she connected with Walt even though it was not what she normally would have done. 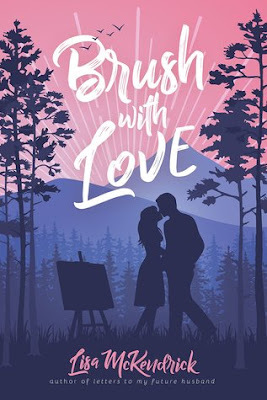 I loved the setting of rural Idaho with an array of characters in the community, including the sneaky and loveable LeVan who taught Lana more about life than she expected from their painting collaboration. There is heartache, humor, sweet romance, and the most memorable first kiss! There are some references to the characters belonging to The Church of Jesus Christ of Latter-day Saints but this is a book that can be enjoyed by all with its universal Christian themes. Lisa McKendrick is the author of several books for the LDS market, including, most recently, Letters To My Future Husband. She received her master's degree in English from BYU, and is the mother of seven children. She enjoys traveling, yoga, garage sales, and getting feedback from her readers.